Art talk with Larry Gatz from the Art Institute of Austin. We are standing in front of my work on display at Jerry's Artarama Austin. The work will be on display through August 2012. 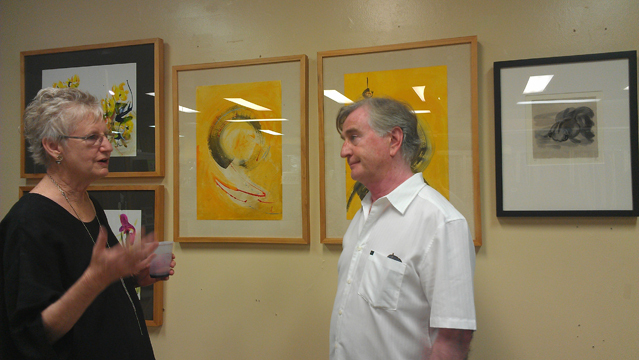 Seeing my art on the wall of Jerry's Artarama was a moving experience. In the past I have rarely shown my art because I have a job that supports me in a creative way; and because showing art takes away from making art. In addition, the non-commercial venue of mail art is a satisfying and affordable way of exhibiting. But lately several "push" techniques have made me go more public. First the WEST studio tour made it easy to exhibit because the concept is to simply open your studio and let the public look at your work where it is made. I found this casual open format to be relaxed and successful. I put the art on black foam core and in plastic bags and sold enough to make a profit. In the second push to show came from one of my favorite art supply stores, Jerry's Artarama. They selected me as "Customer of the Month" and said I would be featured in a zine interview and they would hang my work on an open wall in the store. I selected work that has a general tai chi theme. There were 2 flower paintings done with my tai chi sword. There were 2 golden zen circle paintings shown above. I also showed the chine-colle fish print from an iPad drawing. Finally there were 2 zen circles plus good-luck Chinese goldfish on brown pastel paper. Jerry's master framer, Dion, expertly framed the pieces in the gallery frame selection in the store with some custom mats that complemented the work. Store manager, Catherine offered gift bags with a soft pencil, brush, eraser, and coupon for the store. Two faculty members and four students came to the event along with a number of friends, supporters, and people who read about the opening in the zine. It was great to talk about my work in depth with them. I enjoy going to Jerry's several times a week and explore a wide range of art supplies. In addition the staff are all artists themselves and create a stimulating atmosphere as they promote local shows and give great advice on tools, materials, and techniques. I am getting used to hanging the work in public and enjoying the interaction with my peers, the public, and students outside of school. Thank you Jerry's and all the friends who came to the exhibit.